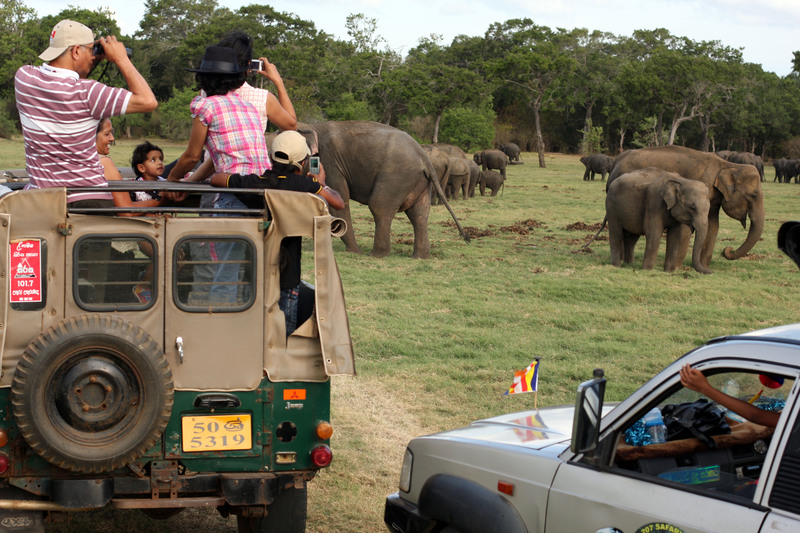 This is one of Sri Lanka’s most popular parks, and if you like elephants it’s a must see, at least during the dry season from June to September. At this time elephants come together in huge numbers to feed, drink and bathe beside a large man-made Tank (lake). 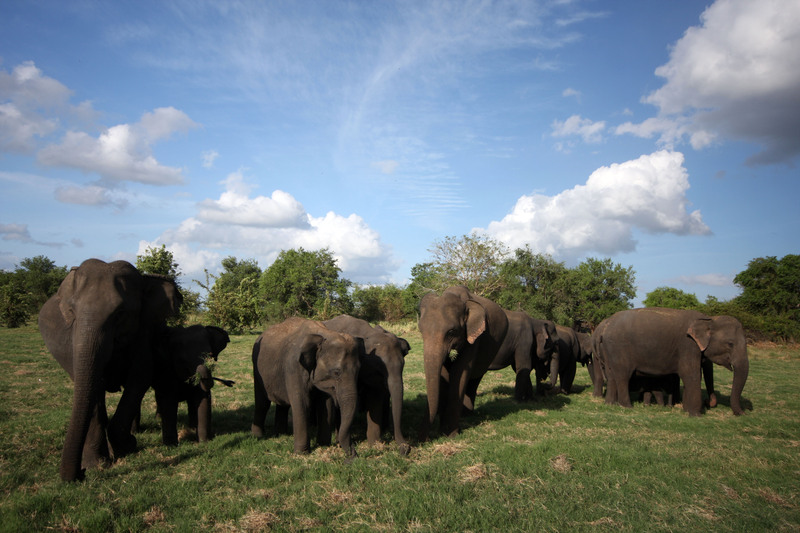 This amazing sight has been labelled ‘the Gathering’ and is a unique phenomenon: nowhere else in the world will you find such a high concentration of wild Asian elephants. On my visit there were very few other vehicles in the park and, once we emerged from the forest of thorny green bamboo that begins at the entrance gate, it truly felt like entering an enchanted world. 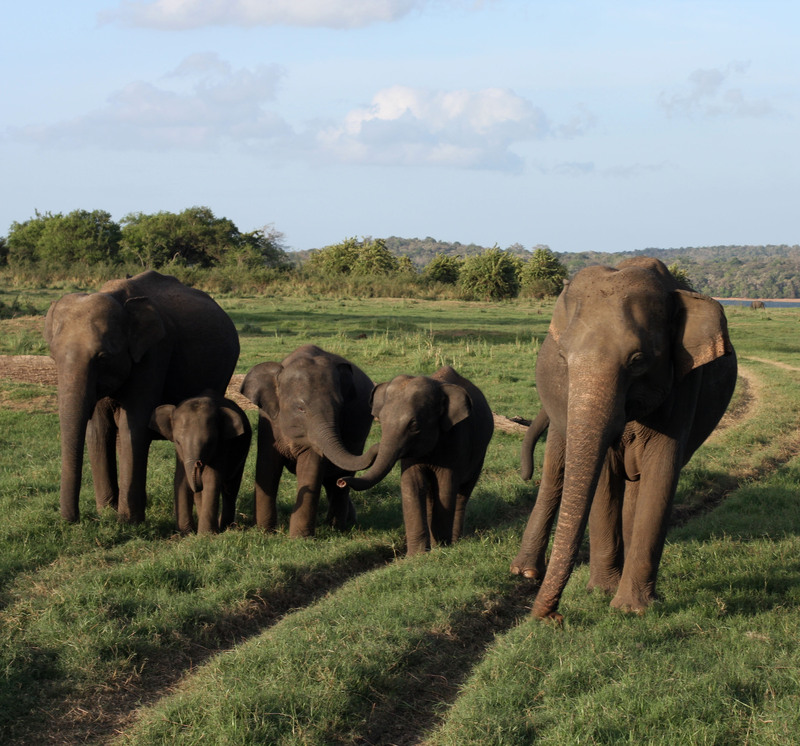 I was captivated by the sheer number of elephants, and by how close we got to them, although at one point our jeep was charged by a nervous mother. 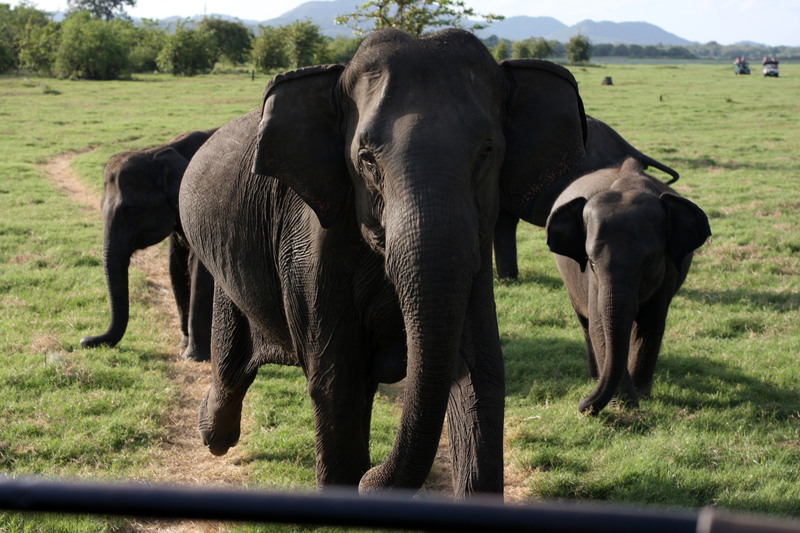 We all yelled ‘Drive!’ as the female thundered towards us, her large ears waving, her trunk raised. It was a little scary, since an elephant would have no trouble tipping over a jeep. Minneriya Tank also attracts an enormous variety of birds (160 different species live in the park), and I later made a list of everything we saw (that we were able to identify). It ran: green bee-eater, land monitor, mongoose, peacock, jungle fowl, monkey, pipit, buffalo, open-billed stork, egret, cormorant, white necked stork, spoonbill, grey heron, black-headed ibis, red-wattled lapwing, and a lot of elephants. Entrance to the park costs about R3300 per person, for a non-resident foreigner. I went with Pubudu Kumar, who is based in Inamaluwa Junction, the turn off to Sigiriya on the Habarana to Dambulla road (Tel. 0777 426803). He was an excellent guide and charged very reasonable prices. Going to meet Pubudu now . Hope he doesn’t disappoint.